Understanding the impact of ENMs in the environment is extremely challenging, due both to lack of data (on released amounts as well as their toxic potential) and technical difficulties, and the answer to this question is still uncertain. Since they can be found in most media , the evaluation of the potential release of ENMs, as well as a deep understanding of their transport processes and chemical transformations and the effects of exposure to ecologically relevant species, are fundamental for a responsible development of this new industrial sector. The potential risks are still being investigated, but the toxic responses of various organism exposed to ENMs have already been revealed by in vivo and in vitro studies  . Unfortunately, the available toxicological information on the enormous variety of chemicals employed in the market is still extremely scarce and the excessive costs of traditional toxicity evaluation make unfeasible to fill the knowledge gap, especially considering that the number of new ENMs is continuously increasing  . 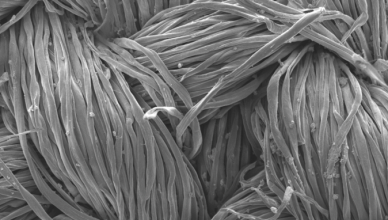 Furthermore, the nanoscale character of these materials, which is what confers them special properties such as higher tensile strength and durability, might also be responsible for completely different toxic properties with respect to the same substance in bulk form, as well as different fate and transport behavior, leading to potential unique effects   . On the other hand, while monitoring the concentrations of ENMs in the different environmental media could clearly constitute a valuable way to assess exposure levels, the current technology is not yet sufficient to provide these measures and it is still at the developing stage      . The impact of nanotechnology on the environment is determined by two fundamental factors: the potential hazard due to ENMs and the exposure levels of the ENM or, in other words, its concentration in the different environmental media. They are strictly related since if one them is absent, there is no environmental risk. On the other hand, even a very low concentration of a very hazardous substance can represent a considerable risk. However, at the basis of both evaluations there is another important element, which is an appropriate characterization of the physico-chemical properties of the substance of concern , like particle size distribution, shape, solubility, etc. Indeed, it is well known that physical properties, such as the particle size distribution, can drastically affect both the potential toxicity of the material, that is its hazardousness, and its behavior in the different media, or in other words its intermedia transport properties, which determine the concentration in the environment. Of course, one does not have to forget that the transport processes the ENMs undergoes are also strongly influenced by the specific conditions of the environment. For example, it is well known that ENMs in the environment tend to abandon their original form to aggregate, agglomerate or associate with other matter . Photocatalytic degradation Excitation of the photocatalytic ENM induced by light and its photolysis (decomposition). Oxidation Oxidation of the nanoparticle surface due to the loss of electrons. Reduction Reduction of the nanoparticle surface due to the uptake of electrons. complexation ENMs associating with other molecular or ionic chemical substances dissolved in the environmental matrix. Dissolution The ENM dissolves in water releasing ions or molecules. Precipitation Dissolved species forming a solid phase, such as metal ions released from an ENM precipitating into a solid material. Agglomeration Reversible coagulation of primary particles to form clusters. Sedimentation Process whereby ENMs in suspension settle out of the water phase. heteroaggregation The association of the ENM with other solid surfaces in water. processes The ENM undergoes a transformation due to the presence of living organisms. This may include processes such as biological oxidation and degradation, interactions with bio-macromolecules excreted by organisms (e.g. leading to surface coating of the ENM). Release rates to the different environmental compartments over the entire life cycle of the materials, together with the determinants regulating their transport and transformation processes across the different media, are key factors for a correct assessment of the potential impact of ENMs on the environment. The transport processes ENM (sedimentation, dry and wet deposition, aerosolization, soil runoff…) are governed by their physico-chemical properties, with particle size representing the major influence factor. Nonetheless, also geographical and meteorological parameter can strongly affect the particle concentration in the different compartments. However, it is fundamental to remember that, as in the case of occupational exposure assessment, both the operational conditions and the risk management measures (RMMs) employed affect the levels of exposure to ENMs. Particle size Information on primary particle size, size range and number size distribution. It governs the transport properties of the ENM (mass diffusivity, sedimentation velocity, deposition velocity, attachment efficiency) and affects the toxicological properties of the substance. Information on the physical form (particle, tube, rod…), whether it is in free particulate form or in an agglomerated/ aggregated state as well as whether the preparation is in the form of a powder, solution, suspension or dispersion. It is fundamental to evaluate release rates. The release of ENM contained in liquids, pastes, creams, powders and aerosol spray is expected to be significant. However, ENM not incorporated strongly into the matrix of larger-particle materials may also be emitted during the use of the solids (mechanical abrasion, aging) . Solubility Information on solubility of the ENM in relevant solvents and their partitioning between aqueous and organic phase. It can be the dominant mechanism for nanoparticles removal from water . Aggregation state Homoaggregation or heteroaggregation can both occur. They leads to the elimination of the nanoparticles from water and air by sedimentation and deposition respectively. Can be affected by various factors such as pH, temperature, surface chemistry and the presence of ions. chemistry Specific surface area of the ENM and surface reactivity. It affects transformations processes. Sorption It includes adsorption, absorption and ion exchange, fundamental physical factor in aquatic environment. Plays an important role in altering NM reactivity. 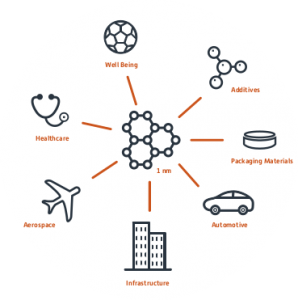 Nanomaterials have significant adsorption capacities because of their relatively large surface area and they can bind or carry other molecules (dissolved organic matter, surface-active dispersing agent, contaminants and proteins). The physicochemical properties of NMs can be altered by attaching these molecules to the surface. Stability and mobilization of NMs in environmental media can be affected . Precipitation intensity In millimeters per hour (mm/h) over a given duration. It affects wet (air→water, air→soil) deposition and soil runoff. Wind intensity It is the wind speed. It is responsible of soil resuspension (soil→air), affects dry deposition (air→soil, air→water) and aerosolization (water→air). Interfacial area Surface of separation between two environmental media. It plays a role in aerosolization (water→air), deposition (air→water, air→soil) and sedimentation (water→soil). Water currents or wave action The motion of waves, sea and lakes currents and rivers flow. It causes sediment resuspension in water (soil→water). Soil properties Like soil depth, density, type of soil, erodibility, average soil particle size… It affect soil loss due to runoff. pH Acidity or basicity of an aqueous solution. Changes in the pH of the suspension lead to changes in the surface charge density . Ionic strength Measure of the concentration of ions in the solution. It affects agglomeration and aggregation. It alters the charge screening and, therefore, the range of electrostatic repulsion. In the case of natural waters with sufficiently high ionic strength, ENMs are expected to form agglomerates with diameters exceeding 100 – 1000 nm. Concentration of organic matter Natural organic matter (NOM), such as the humic substances found in water, sediment, and soil, is one of the substances capable of interacting with ENPs. The presence of NOM affects the state of aggregation of the nanoparticles by forming a charged external interaction with the nanoparticle surface that improves the steric stability of the system, hence influencing the mobility of the particles in the environment . Release Rate An average release rate over the year (kg/day) to wastewater, surface water, air and soil at different scales. 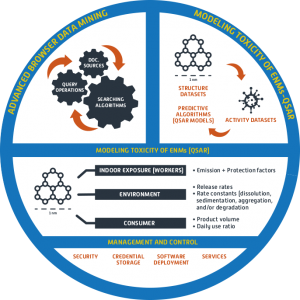 A release assessment covering the whole ENM lifecycle is required (production, incorporation processes, use, waste handling and recycling processes). Tonnage information The amount of ENM used in the industrial site per day. Conditions of use/design of the technical process Whether the process is fully open or contained. Onsite Risk Management Measures Filters, scrubbers, biological or physico-chemical wastewater treatment plants. Biological Sewage Treatment Plant (STP) Releases to the environment by water are reduced by degradation, volatilisation and adsorption on sludge; releases to air may occur, and to agricultural soil will occur if the sludge is applied as fertilisers (leading to a transfer of substance from water to soil and by further transport to crops etc.). Waste treatment operations Waste incineration (municipal waste incineration, hazardous waste incineration, sewage sludge incineration) and landfilling. Frequency of release Releases of substances can either be continuous or intermittent (less than once per month and for no more than 24 hours).